Scaring people is frowned on, generally speaking: whether you're jumping out of a dark corner or mailing someone a letter that has "PAST DUE" in big red letters on the front. But the creators of The Evil Within 2 have made a career out of it. 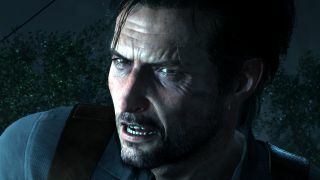 Even after the original Evil Within's mixed reception, Tango Gameworks couldn't wait to jump right back in, learn from its missteps, and scare us even harder. What keeps drawing the team to horror? I put that question to studio director Shinji Mikami, game director John Johanas, and writer Trent Haaga at QuakeCon 2017. Here's what they said. "Some people love to go into a haunted house," Mikami explains through a Japanese interpreter. "Other people may get a thrill from riding a roller coaster. I love getting into horror games. That's how I am. What I don't like the most are ferris wheels. They're really scary, no thank you to that." Yep. The director of the original Resident Evil is afraid of ferris wheels. To be fair, I can see what he means. They are a bit imposing. "It's kind of a weird question," Johanas begins, taking a moment to think. "I mean, I grew up playing horror games. But when you make something, the goal is to get that sort of visceral response out of an audience - especially nowadays when you can literally watch people play on YouTube or Twitch or something. And you get to see people emotionally affected by things you make. "It's rewarding in a different way, especially if you're someone who makes horror games, to see that what you make literally had an effect on how someone's experiencing something. And it's much more extreme than in other formats of games, I think." "I'm a horror guy, I have been for years, it's primarily what I make," Haaga says. "And I think a lot of it has to do with the fact that I love the taste of a bitter pill. You know what I mean? This is a delivery system for truths that are a little bit cynical that we don't want to acknowledge. And just doing sort of a dank prison drama doesn't give deliver the same message in a way that a sort of a bitter pill that you enjoy taking [does]. "That's what horror is. You know, you've got monsters and whatever, but ultimately this is a story about a guy who loses his daughter and is on a redemptive quest to try to get back what he's lost, and that's what's underneath there, in the middle of the bitter pill. And I love that, I love horror. Because of the delivery system that it provides." I push a bit and ask if Haaga could tell me about some of those 'cynical truths' he mentioned before. I'm not fishing for story spoilers, just themes that the game uses horror to explore. He obliges. "Well, you know, perhaps that [...] the things that you've done in the past resulted in the situation that you're at now. And coming to terms with that, acknowledging it, and being able to get over it as a hero does, in [main character Sebastian Castellanos'] transformative journey to come out successful at the other end. Human drama wrapped inside of horror is the best way to deliver it, in my estimable opinion," Haaga concludes, laughing. So that's the "why" covered. Make sure you read our hands-on The Evil Within 2 preview and watch Evil Within 2's introduction to creepy serial killer Stefano Valentini for more of the "how".